Project Blue Book is the code name for the USAF investigation into UFOs which succeeded Project Sign and Project Grudge. Project Blue Book was carried out under the direction of the ATIC and later the FTD between March 1952 and December 17, 1969. It received thousands of UFO reports, many of which were investigated in person. Edward J. Ruppelt was the first head of the project. During most of his tenure, Ruppelt and his team were authorized to interview any and all military personnel who had seen UFOs. Blue Book investigators were not required to follow the usual chain of command and each USAF base had a Blue Book Officer who collected UFO reports and forwarded them to Ruppelt. As part of this process, Ruppelt commissioned the Battelle Memorial Institute to create a UFO sighting questionnaire and computerize the data. Using case reports and the computerized data, Battelle then did a statistical study of all UFO cases available to Project Blue Book. The study was completed in 1954 and is known as "Project Blue Book Special Report No. 14"
Project Blue Book was making very good progress when it was stopped in its tracks by the CIA. The agency accomplished this by assembling a group of so-called experts known as The Robertson Panel. The panel arbitrarily concluded that UFOs do not represent a direct physical threat to national security and that all reported sightings should be publicly debunked. If a sighting could not be debunked, the media was to be told that the situation was being analyzed and to transfer any important information to the 4602nd Air Intelligence Squadron (AISS) of the Air Defense Command. All this was done secretly, reducing Project Blue Book to a mere facade. Coincidentally or otherwise, Ruppelt and others who had voiced opposition to the restructuring were soon reassigned. Project Blue Book was terminated by Secretary of the Air Force, Robert C. Seamans, Jr. who used the Condon Report, and a further review of that report by the National Academy of Sciences to support his decision. Past UFO studies, and Air Force experience in investigating UFO reports were supposedly also taken into consideration. However we do not know what experiences were cited and can only surmise that they were cherry picked to support an agenda to shut down the project. Secretary Seamans Jr., stated that the program "no longer can be justified either on the ground of national security or in the interest of science." Both of these reasons were known at the time to be invalid. UFOs that could not be identified as natural or manmade objects had compromised restricted air space, been associated with the disruption of civilian and military equipment, and been pursued by military aircraft. In retrospect is is clear that the process of shutting down Project Blue Book was to distance the USAF from the public with respect to UFO related information. Adding to the cover-up, many documents we see today that were declassified or released under the FOIA are not the originals. In some cases they are not even true copies. Below is a microfilm segment of one such document that sports a badly pasted insert covering the second paragraph. Because the typeface on the insert is larger than on the document, the insert must also have been made on an entirely different typewriter. The only value these released documents have is to cause serious ufologists to wade through thousands of pages of irrellevant data that prove nothing about the reality of UFOs. 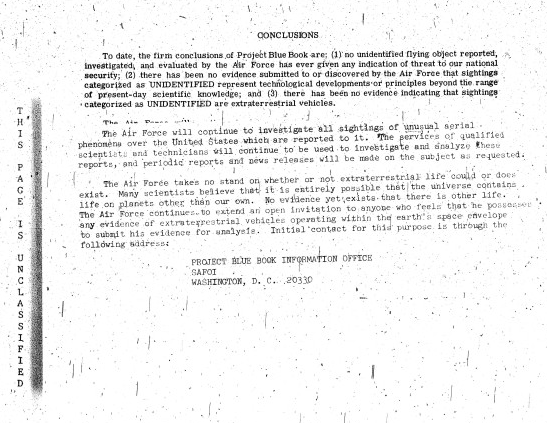 However something interesting about this particular excerpt is that after Project Blue Book was shut down, it clearly states that the USAF was going to continue investigating UFOs using "qualified scientists and technicians", something that the USAF has often since denied.